So…this has nothing to do with romance. But if you follow me on Twitter, you know I was baking a cake this weekend. A vanilla malt cake with pretzel malt crunch, white chocolate ganache and cookie butter buttercream. And of everything, it seems to be the cookie butter buttercream that is attracting the most attention. Several people asked for the recipe. Unfortunately, until this morning, it didn’t exist yet. So I’m just typing it up and leaving it here for those who asked. I based this recipe on the BraveTart recipe for German Buttercream. German Buttercream uses a custard base so it’s pretty stable and easy if you’ve ever made a cornstarch pudding or pastry cream. Unlike Swiss Meringue Buttercream, you don’t have to mess with a hot sugar syrup and it works great if you refrigerate the custard overnight so temperature issues aren’t as much of a problem if you’re a novice baker. I will say that it tastes uncannily of french vanilla ice cream without any flavorings so if you’re not looking for a super rich flavor, this is probably not going to be the right buttercream to use. 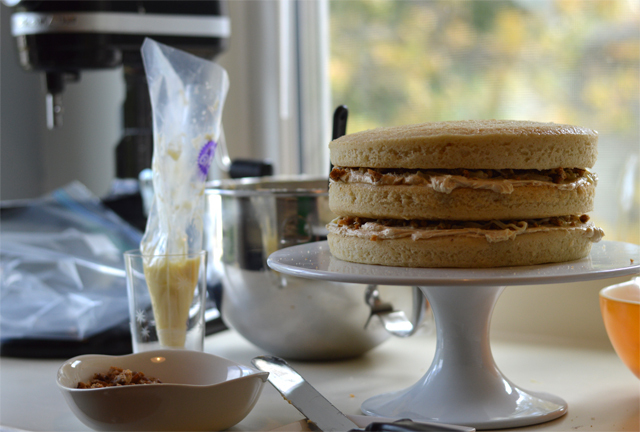 It was perfect for this weekend’s cake and the ideal medium for cookie butter, but I think the Swiss Buttercream will likely remain my standard. I prefer the delicate flavor and precise finish for decorating. German Buttercream seems to be better for making loosey-goosey homemade-looking style cakes though so if you’re not going for the super-finished look, this is totally fine. And…it’s unholy delicious. So there’s that. This frosting tastes like french vanilla ice cream with cookie butter. In a medium pot, bring the milk and vanilla bean seed pods to a simmer. Remove from heat and let stand one hour. After and hour, remove the vanilla bean seed pods and return the milk to a simmer. In a medium bowl, whisk the sugar, cornstarch, whole eggs and egg yolks together. Whisk about half a cup of hot milk into the egg mixture to temper it. Pour the egg and milk mixture back into the simmering milk, whisking constantly. Once it begins to thicken and bubble, whisk constantly for a full minute more. The texture should resemble vanilla pudding. Pour the custard into a large mixing bowl, cover with plastic wrap touching the surface of the custard and refrigerate overnight. In a stand mixer fitted with the whisk attachment, whip the custard on medium speed until it is smooth and creamy. Add the room temperature butter a tablespoon at a time until it is all incorporated. You made need to scrape down the sides of the mixer and the beater with a spatula a few times to get everything mixed properly. Then add the salt and whip to combine. Once the butter is all added and the mixture is smooth and creamy, add the cookie butter and whisk to combine. Before using to frost a cake, refrigerate one hour as this buttercream is a little bit loose. Recipe yields plenty of buttercream to frost a three-layer, 9-inch cake. While whipping the buttercream your stand mixer, Don’t worry if it looks a little curdled at one stage (in the middle of adding the butter). Like Swiss Meringue Buttercream, just keep whipping and it should come together just fine. The BraveTart recipe this is based on has a ton of great suggestions for overcoming buttercream challenges so if you find yourself stuck, there’s a lot of great trouble-shooting information there.